Above are two export Rickys, serial numbers DG851 (left) and DK620 (right) with the Harrison style tailpiece. The guitar on the left was shipped to England in August of '64, and DK620 was shipped in January of '65. This guitar is serial number DK617, obviously produced very shortly before DK620, and apparently shipped to Rose-Morris in the same January '65 shipment. 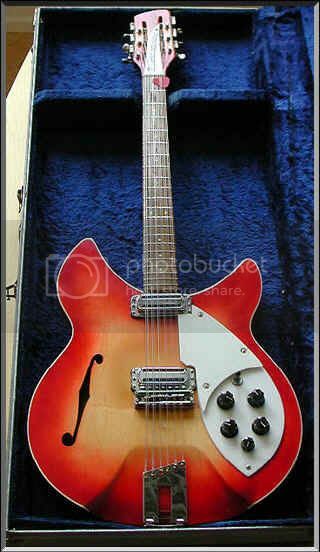 Obviously Rickenbacker was putting both styles of tailpiece on the guitars at the same time, whether some were ordered that way specially, or just whatever was in the parts bin at the time went on the guitar is lost to history. I am the current owner of DK620, posted above. It did ship in January 1965, but the trapeze tailpiece it's wearing is NOT original to the guitar. 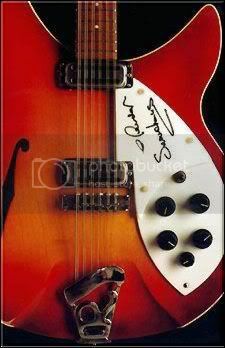 It originally had the Rickenbacker "R" tailpiece, which I recently remounted on the guitar. So - trapeze tailpiece only through October 1964, and "R" tailpiece from that point forward. Carl's Rose Morris 1993 model has a trapeze tailpiece and also a short "stubby" shaped truss rod cover. 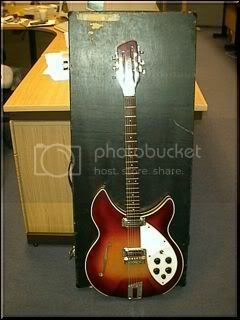 This more than likely dates the guitar to July 1964, when a large batch of identical guitars were created. Most were shipped to the U.K. but Carl most likely purchased the guitar locally (since some of the "export" spec guitars leaked to dealers in the U.S. which would technically make this a "330S/12" instead of a Rose Morris 1993). Anyway, just wanted to clarify some misinformation here! Carry on.. great forum on one of the all-time great bands.